To tell about the Colgate-Palmolive Company as a company using advanced technologies both in the production of high-quality hygiene products and advanced technologies in the promotion and development of business. Сolgate - Palmolive - the first in Russia and in the world launched a joint brand project with Prisma, becoming the foremost in the use of neurotechnologies for marketing purposes. A joint project with one of the most popular mobile applications in Russia and in the world of Prisma was launched. 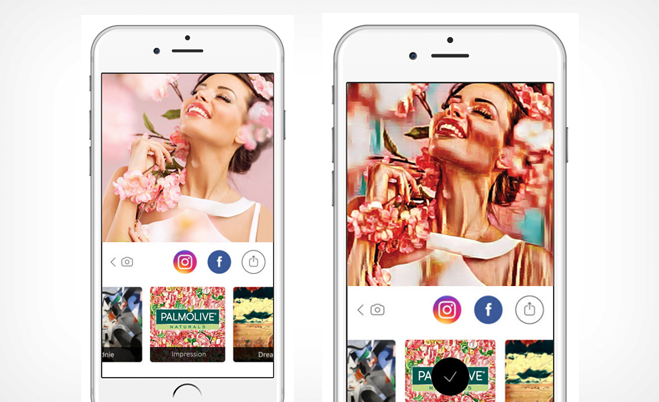 Within the framework of the application, the first female flower filter Palmolive Impression was launched to process photos in the style of the best impressionists in branded colors of the brand using the main floral key visual novelties Palmolive Naturel Seductive Softness. On the basis of the project, an individual newsworthy event and a corporate press release on the project for Colgate-Palmolive offices with the purpose of intracorporate PR and the possibility of using the project for marketing purposes in other countries (For free). On the basis of the project, an individual newsworthy event and an international press release on the joint brand project Colgate-Palmolive and Prisma and the success story of using advanced neurotechnologies for marketing purposes. More than 250 publications in Russia (of which about 100 are corporate and professional marketing). More than 400 (about 300 public) in international media.